Nicky Woolf, “Abu Hamza Sentenced to Life in Prison on US Terrorism Conviction,” Guardian (London), January 9, 2015, https://www.theguardian.com/world/2015/jan/09/abu-hamza-sentenced-life-impisonment-terrorism-conviction. Born in Alexandria, Egypt, in 1958, Abu Hamza began to show an interest in religion in the early 1980s while living on a student visa in England. There, he studied civil engineering at Brighton Polytechnic College and worked at a nightclub in London. While in England, Abu Hamza met, and ultimately married, a British woman who reportedly encouraged him to become more religiously observant.“Abu Hamza Profile,” BBC News, January 9, 2015, http://www.bbc.com/news/uk-11701269. In 1987, Abu Hamza traveled to Mecca, Saudi Arabia, where he met with the spiritual leader of the Afghan Mujahideen movement, Abdullah Azzam.Duncan Gardham, “Nightclub Bouncer Who Became the Cleric of Hate,” Telegraph (London), February 8, 2006, http://www.telegraph.co.uk/news/uknews/1509940/Nightclub-bouncer-who-became-the-cleric-of-hate.html. By his own account, the meeting with Azzam ultimately inspired Abu Hamza to leave England in 1991 and travel to Afghanistan, where he worked on a Saudi-funded project that built factories, schools, and mosques, and provided resources to refugees in the aftermath of the Soviet-Afghan War.Duncan Gardham, “Nightclub Bouncer Who Became the Cleric of Hate,” Telegraph (London), February 8, 2006, http://www.telegraph.co.uk/news/uknews/1509940/Nightclub-bouncer-who-became-the-cleric-of-hate.html. 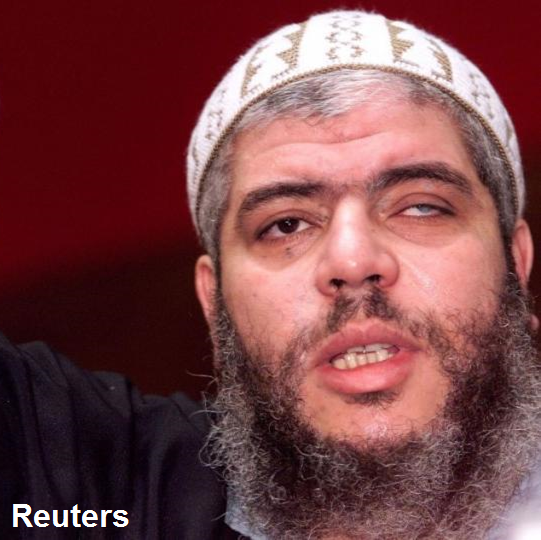 While traveling to the region, Abu Hamza lost his eye and both of his hands, though the details of his injury are not consistent. At one point, Abu Hamza claimed to have sustained the injury while participating in a demining project in Jalalabad.“Controversial Cleric of UK Mosque,” CNN, April 1, 2003, http://www.cnn.com/2003/WORLD/europe/01/20/uk.hamzaprofile/. At his U.S. trial, however, Abu Hamza said that he was wounded while handling explosives with the Pakistani military in Lahore.“Abu Hamza Profile,” BBC News, January 9, 2015, http://www.bbc.com/news/uk-11701269. “1997: Egyptian Militants Kill Tourists at Luxor,” BBC News, accessed April 21, 2017, http://news.bbc.co.uk/onthisday/hi/dates/stories/november/17/newsid_2519000/2519581.stm. In subsequent years, Abu Hamza gained control over the Finsbury Park mosque, delivering almost all of the sermons. According to reports, Abu Hamza’s supporters would often bar entry to the mosque to outsiders and anyone whom Abu Hamza deemed a threat.“Abu Hamza Profile,” BBC News, January 9, 2015, http://www.bbc.com/news/uk-11701269. During this time, Abu Hamza associated remotely with Yemen-based extremist figures, even claiming to serve as the “legal officer” for the al-Qaeda-affiliated Islamic Army of Aden terrorist group.“Designation of 10 Terrorist Financiers Fact Sheet,” U.S. Department of the Treasury, April 19, 2002, https://www.treasury.gov/press-center/press-releases/Pages/po3014.aspx. Abu Hamza was contacted by British police in 1999 for suspected ties to bomb plots in Yemen.“Abu Hamza Profile,” BBC News, January 9, 2015, http://www.bbc.com/news/uk-11701269. In late December 1998, Abu Hamza participated remotely in a hostage-taking operation in Yemen that resulted in four deaths. Prior to the attack, Abu Hamza had provided the lead abductor with a satellite phone, using it to speak with the abductor both before and during the operation. On December 28, abductors stormed a caravan carrying 16 tourists, taking them hostage by force. During the attack, Abu Hamza agreed to act as an intermediary on behalf of the abductors, and continued to provide advice to the abductors over the phone.“Mustafa Kamel Mustafa, A/k/a “Abu Hamza,” Convicted Of 11 Terrorism Charges In Manhattan Federal Court,” U.S. Department of Justice, May 19, 2014, https://www.justice.gov/usao-sdny/pr/mustafa-kamel-mustafa-aka-abu-hamza-convicted-11-terrorism-charges-manhattan-federal. On December 29, during a rescue attempt by the Yemeni military, the abductors used the hostages as human shields, resulting in the deaths of four hostages and the injury of several others.“United States of America v. Mustafa Kamel Mustafa: Indictment,” U.S. Department of Justice, April 19, 2004, https://www.justice.gov/archive/usao/nys/pressreleases/October12/ChargingDocs/Mustafa,%20Mustafa%20Indictment.pdf. The attack was claimed by the Islamic Army of Aden, which would also claim credit for the USS Cole bombing in 2000.“Designation of 10 Terrorist Financiers Fact Sheet,” U.S. Department of the Treasury, April 19, 2002, https://www.treasury.gov/press-center/press-releases/Pages/po3014.aspx. Abu Hamza continued to preach at the Finsbury Park mosque, all the while supporting terrorist operations abroad. In 1999, Abu Hamza and several co-conspirators attempted to establish an al-Qaeda training camp in the United States, based in Bly, Oregon. In late November 1999, Abu Hamza dispatched several British-based al-Qaeda operatives to establish the camp. One of the operatives, Oussama Abdullah Kassir, brought with him a manual on the use of sarin nerve gas.“Mustafa Kamel Mustafa, A/k/a “Abu Hamza,” Convicted Of 11 Terrorism Charges In Manhattan Federal Court,” U.S. Department of Justice, May 19, 2014, https://www.justice.gov/usao-sdny/pr/mustafa-kamel-mustafa-aka-abu-hamza-convicted-11-terrorism-charges-manhattan-federal. As part of the conspiracy, U.S.-based al-Qaeda operatives began to stockpile weapons and ammunition, according to U.S. court documents.“United States of America v. Mustafa Kamel Mustafa: Indictment,” U.S. Department of Justice, April 19, 2004, 6, https://www.justice.gov/archive/usao/nys/pressreleases/October12/ChargingDocs/Mustafa,%20Mustafa%20Indictment.pdf. Meanwhile, Abu Hamza also continued to work as a facilitator for foreign fighters. In November 2000, Abu Hamza began arranging safehouses and lodging in Pakistan for foreign fighters traveling to Afghanistan.“United States of America v. Mustafa Kamel Mustafa: Indictment,” U.S. Department of Justice, April 19, 2004, 11, https://www.justice.gov/archive/usao/nys/pressreleases/October12/ChargingDocs/Mustafa,%20Mustafa%20Indictment.pdf. John Steele, Sean O’Neill, Richard Alleyne, and Sue Clough, “Police Seize Weapons in Mosque Raid,” Telegraph (London), January 21, 2003, http://www.telegraph.co.uk/news/uknews/1419533/Police-seize-weapons-in-mosque-raid.html. Joseph Ax, “London cleric Abu Hamza sentenced to life in U.S. prison,” Reuters, January 9, 2015, http://www.reuters.com/article/us-usa-security-imam-idUSKBN0KI0DA20150109. Abu Hamza“Consolidated United Nations Security Council Sanctions List,” United Nations Security Council, accessed April 7, 2017, https://www.un.org/sc/suborg/en/sanctions/un-sc-consolidated-list. Abu Hamza al-Misri“Specially Designated Nationals and Blocked Persons List (SDN),” U.S. Department of Treasury, accessed April 7, 2017, https://www.treasury.gov/resource-center/sanctions/SDN-List/Pages/default.aspx. Adam Ramsey“Consolidated United Nations Security Council Sanctions List,” United Nations Security Council, accessed April 7, 2017, https://www.un.org/sc/suborg/en/sanctions/un-sc-consolidated-list. Adam Ramsey Eaman“Consolidated United Nations Security Council Sanctions List,” United Nations Security Council, accessed April 7, 2017, https://www.un.org/sc/suborg/en/sanctions/un-sc-consolidated-list. Adam Ramsey Eman“Specially Designated Nationals and Blocked Persons List (SDN),” U.S. Department of Treasury, accessed April 7, 2017, https://www.treasury.gov/resource-center/sanctions/SDN-List/Pages/default.aspx. Kamel Mustapha Mustapha“Consolidated United Nations Security Council Sanctions List,” United Nations Security Council, accessed April 7, 2017, https://www.un.org/sc/suborg/en/sanctions/un-sc-consolidated-list. Mostafa Kamel Mostafa“Consolidated United Nations Security Council Sanctions List,” United Nations Security Council, accessed April 7, 2017, https://www.un.org/sc/suborg/en/sanctions/un-sc-consolidated-list. “Ibrahim, Mostafa Kamel Mostafa,” Interpol, accessed April 13, 2017, https://www.interpol.int/en/notice/search/un/1419422. Mustafa Kamel“Specially Designated Nationals and Blocked Persons List (SDN),” U.S. Department of Treasury, accessed April 7, 2017, https://www.treasury.gov/resource-center/sanctions/SDN-List/Pages/default.aspx. Mustafa Kamel Mustafa“Abu Hamza Profile,” BBC News, January 9, 2015, http://www.bbc.com/news/uk-11701269. The U.S. Treasury Department designated “Abu Hamza al-Masri” as a Specially Designated Global Terrorist (SDGT) in accordance with Executive Order 13224 on April 19, 2002.“Designation of 10 Terrorist Financiers Fact Sheet,” U.S. Department of the Treasury, April 19, 2002, https://www.treasury.gov/press-center/press-releases/Pages/po3014.aspx. The U.N. Security Council listed “Abu Hamza al-Masri” as an individual associated with al-Qaeda on April 24, 2002.“Consolidated United Nations Security Council Sanctions List,” United Nations Security Council, accessed April 7, 2017, https://www.un.org/sc/suborg/en/sanctions/un-sc-consolidated-list. Mustafa Kamel Mustafa (“Abu Hamza al-Masri” or “Abu Hamza”) is an Egyptian-British citizen and U.S.- and U.N.-sanctioned terrorist associated with al-Qaeda. Mostafa Kamel Mostafa Ibrahim“Consolidated United Nations Security Council Sanctions List,” United Nations Security Council, accessed April 7, 2017, https://www.un.org/sc/suborg/en/sanctions/un-sc-consolidated-list;“Ibrahim, Mostafa Kamel Mostafa,” Interpol, accessed April 13, 2017, https://www.interpol.int/en/notice/search/un/1419422. “You must know the cause of Allah and you must help that cause in fighting, by fighting and when you fight you kill, you don't fight just to negotiate or to show off or to make videos or to make audios, fight to kill not fight to tape.”“In Quotes: Hamza’s Preaching,” BBC News, February 7, 2006, http://news.bbc.co.uk/2/hi/uk_news/4690084.stm. “Don't go to the man who is selling a wine shop and tell him please why you selling the wine shop, come to the mosque? Make sure that the man who gave him the license for that wine shop does not exist anymore on the Earth. Finish him up.”“In Quotes: Hamza’s Preaching,” BBC News, February 7, 2006, http://news.bbc.co.uk/2/hi/uk_news/4690084.stm. “Bring up your daughters to that manners [not to answer back] otherwise they going to be divorced in the first week of their marriage or slapped in the face.”“In Quotes: Hamza’s Preaching,” BBC News, February 7, 2006, http://news.bbc.co.uk/2/hi/uk_news/4690084.stm. “We do not hate Jews because they hurt each other - we hate them for their corruption on earth. A Jew cannot look a Muslim in the eye or pass him knowing they have oppressed a Muslim or some other Jew had oppressed a Muslim elsewhere. So [the] nation of Mohammed must regain their dignity and this dignity would not be regained unless with blood.”“In Quotes: Hamza’s Preaching,” BBC News, February 7, 2006, http://news.bbc.co.uk/2/hi/uk_news/4690084.stm. “They have a common punishment amongst them and they have the virus to run after them wherever they go.”“In Quotes: Hamza’s Preaching,” BBC News, February 7, 2006, http://news.bbc.co.uk/2/hi/uk_news/4690084.stm. “It is not called suicide... this is called martyring, because if the only way to hurt the enemies of Islam except by taking your life for that then it is allowed.”“In Quotes: Hamza’s Preaching,” BBC News, February 7, 2006, http://news.bbc.co.uk/2/hi/uk_news/4690084.stm. “Killing a Kafir who is fighting you is OK. Killing a Kafir for any reason, you can say it, it is OK - even if there is no reason for it.”“In Quotes: Hamza’s Preaching,” BBC News, February 7, 2006, http://news.bbc.co.uk/2/hi/uk_news/4690084.stm.